This map is one result of the U.S. Geological Survey’s intent to provide geologic map coverage and a better understanding of the transition in regional geology between the Basin and Range and Colorado Plateaus in southeastern Nevada, southwestern Utah, and northwestern Arizona. Information gained from this regional study provides a better understanding of the tectonic and magmatic evolution of an area of extreme contrasts in late Mesozoic-early Tertiary compression, Cenozoic magmatism, and Cenozoic extension. This map is a synthesis of 32 new geologic maps encompassing the Littlefield 30' x 60' quadrangle, Arizona. Geologic information presented in this map and report may aid future land management decisions about land use, flood control, and environmental and range management programs for federal, state, and private agencies. The Littlefield 30' x 60' quadrangle encompasses approximately 3,100 km2 (1,937 mi2) of northwestern Arizona. The map area is bordered on the north by the Utah-Arizona state line and is approximately 5 km east of the Nevada-Arizona state line (see map). The quadrangle is bounded by long 113° to 114° and lat 36°30' to 37°. The east three-quarters of the map area is within the southwestern part of the Colorado Plateaus province (herein referred to as the Colorado Plateau), and the west quarter is within the Basin and Range province. The Basin and Range is locally subdivided into three physiographic areas; the Mesquite Basin, the Virgin Mountains, and the Grand Wash Trough (fig. 1, on map sheet). The Colorado Plateau is subdivided into three physiographic areas; the St. George Basin, the Shivwits Plateau, and the Uinkaret Plateau (fig. 1, on map sheet). The St. George Basin is part of the transition zone between the Colorado Plateau and the Basin and Range that extends northward into Utah. The arbitrary boundary between the Basin and Range, the transition zone, and the Colorado Plateau is based on physiographic, geologic, and topographic relations (Stokes, 1977; Billingsley, 1993g). 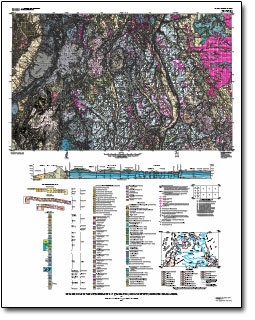 Billingsley, G.H., and Workman, J.B., 2000, Geologic map of the Littlefield 30' x 60' quadrangle, Mohave County, Northwestern Arizona: U.S. Geological Survey Geologic Investigations Map 2628, scale 1;100,000, https://pubs.usgs.gov/imap/i2628.